Shannon Maroney, senior, points to a voter registration booth set up by leaders of the walkout. 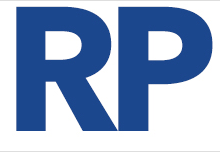 Maroney urged those who would be eligible to vote by the November federal election to register. 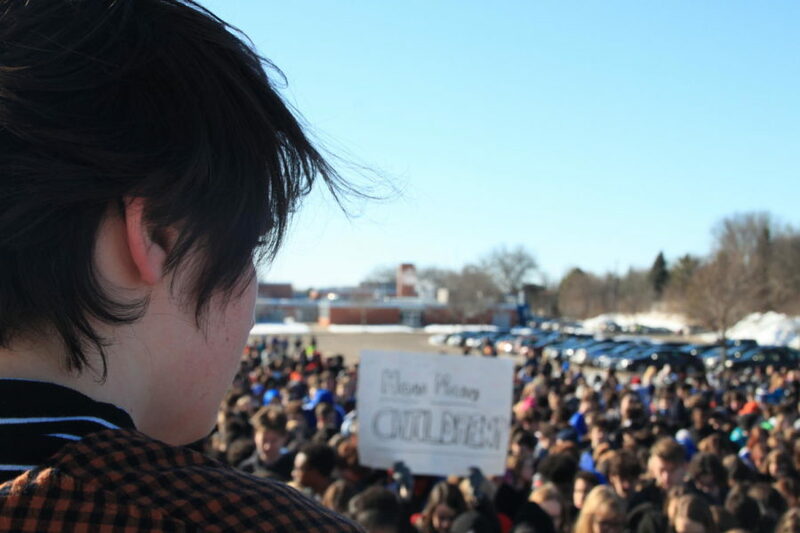 Shannon Maroney, senior, gazes over the crowd of HHS and NJH students participating in the walkout. 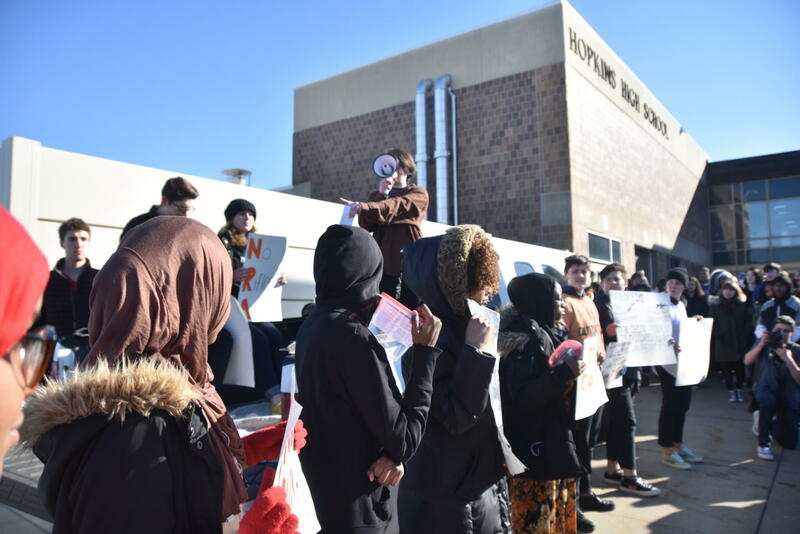 At the front end of the crowd, members and leaders of HHS Responds stood on the bed of a parked truck, rallying students with various chants and impactful posters. To the left, a table encouraging students to register to vote was set up with computers and information. In the crowd were students wanting to make a change. For Marcella Reese, junior, participating in the walkout gave her hope about the future of the movement. “It was very powerful seeing everyone united to end gun violence in schools,” Reese said. Some students took advantage of the gathering as an opportunity to usher in a new generation of voters. Others saw the walk out as a significant step in bringing the younger generation into activism, reform, and politics. “I hope to see out younger generations really strive to make changes in the future, especially because we are the future,” said Rielle Miguel, senior. Containers were also passed around to raise money for a nonprofit organization called Everytown for Gun Safety, which advocates for gun control and against gun violence. Any donation was accepted and appreciated. Over the course of the 17 designated minutes, Ian Feagler and Shannon Maroney, seniors, stood with megaphone in hand and shared their reason for being there. “These 17 people were like us, with jobs and homework and normal high school stressors, like parents, friends, and college possibilities.” Maroney said. “But what is not and should not be a normal high school stressor is watching your peers and teachers get shot at, injured, and killed by a former classmate, followed by questioning, accusations, and even victim blaming by our own president. As school stopped for 17 minutes during the walkout, many classrooms were empty. But in some, one or two students remained. These students who abstained from the walkout did so for many different reasons. Cody Miller, senior, said that he felt pressured to participate to make a statement. Because administration provided accommodations for students participating in the walkout such as unlocking the doors and allowing classes to pause, this led to more students walking out to support the movement. All teachers were given directions to join their students outside if their whole class walked out, but some also had to stay behind if any students decided to stay behind. Bruce Russell Jr., senior, said he participated in the walkout for different reasons than most, and that he understand the collective pressure to participate. “Although I don’t agree with most of the other students on the gun control changes that some want this march to accomplish, I will walkout because I want to respect and mourn the students who were killed at Parkland,” Russell said.